Happy Black Friday! Now that we stuffed ourselves yesterday it is time to take it easy and do one of my favorite past times – a little online shopping (or a lot in my case lol!)! Today’s look features one of the most unique and exciting online retailers out there, Moda Operandi. What I love about them is that the carry so many pieces that you cannot find elsewhere. They also have trunkshows where you can pre-order next season’s styles straight off of the runway. Super cool! It has been summer weather in San Diego the past few days and I took the opportunity to rock this amazing off the shoulder crisp white top. 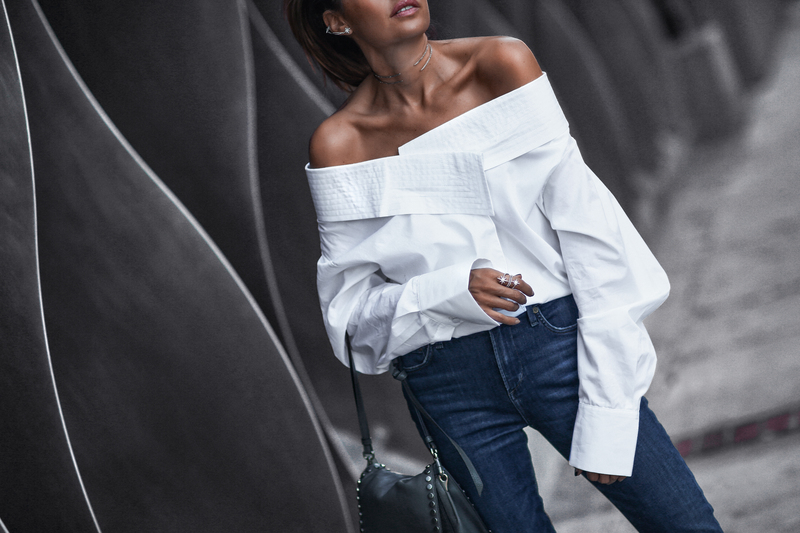 The classic white top with a modern twist is a huge trend this season and I love it because of the chicness factor it exudes. I am obsessed with the the oversized silhouette with extra long sleeves that give off an urban-cool vibe. I styled it for warmer weather, but it would be great to layer a turtleneck or other lighter weight fitted top underneath! The jeans are equally as on-trend as the top. First, this style of jeans has been one of my favorite jeans by Citizens of Humanity for the past few seasons. I own a few different version of this style because they are so flattering as well as super comfortable! 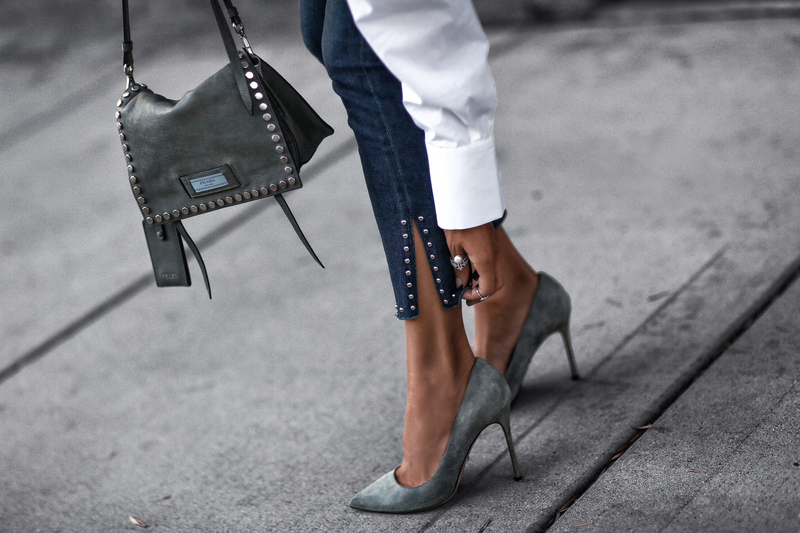 The split, studded hem adds eye-catching interest that will elevate any look – dress them up or down! Special thanks to Moda Operandi for partnering on this post. You look so perfect as always! The outfit is flawless, I especially like the sunnies. Love this shirt, you look stunning! Erica Im loving this white shirt paired with these studded jeans!